First, we’ve never heard anyone calling this route 3 Lakes Trail and we doubt it has any name as a whole. It consists of two sections marked with different colors, but the easiest way to memorize the route is from lake to lake so we just made up this name for ourselves. And it’s not a bad name, because you get the point: you will be rewarded with 3 beautiful alpine lakes surrounded by picturesque peaks during this hike. 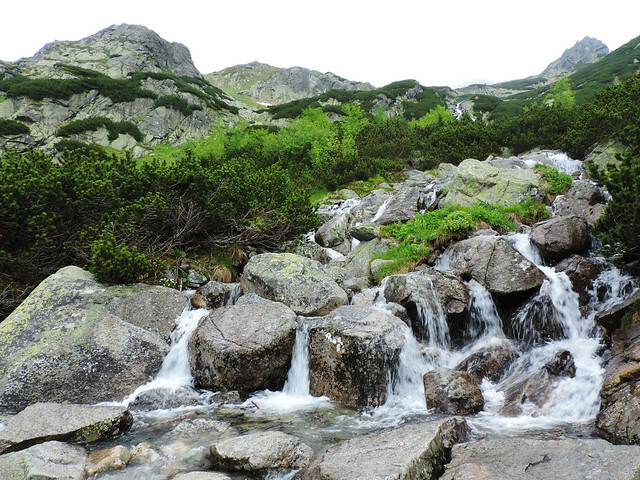 In our opinion this hike is the best introduction to the High Tatras. It’s not too hard but very scenic all the way and it’s also flexible because you can choose to do only part of it and still have an amazing experience. 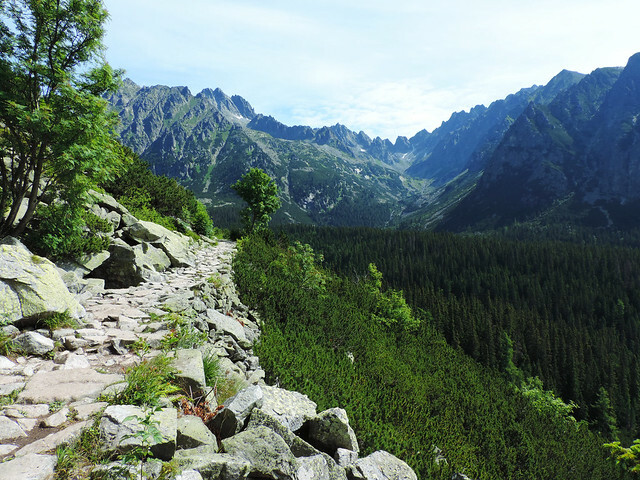 The whole route is a full day hike, but it’s not too steep and there’s no sections secured by chains and ladders (unlike many other routes in the High Tatras). 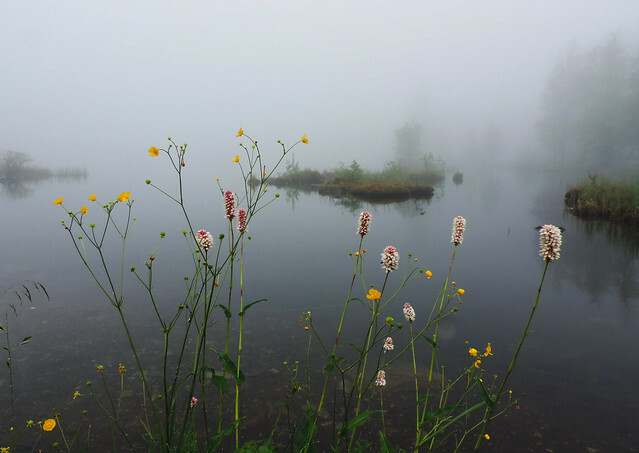 There’s charming clear creeks, lakes and peak views and lots of wildflowers on the way. 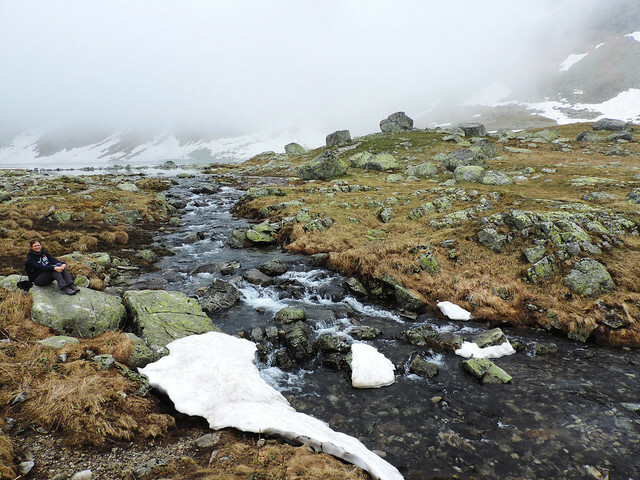 The weather was chilly and foggy on the day when we did this hike, but still it made us fall in love with the Tatras immediately. The dark peaks disappearing in the dense fog reminded us to scenes from Mordor in the Lord of the Rings movies. But when the sun shines you see a landscape from fairyland. The trailhead is actually the first lake itself: Štrbské pleso. 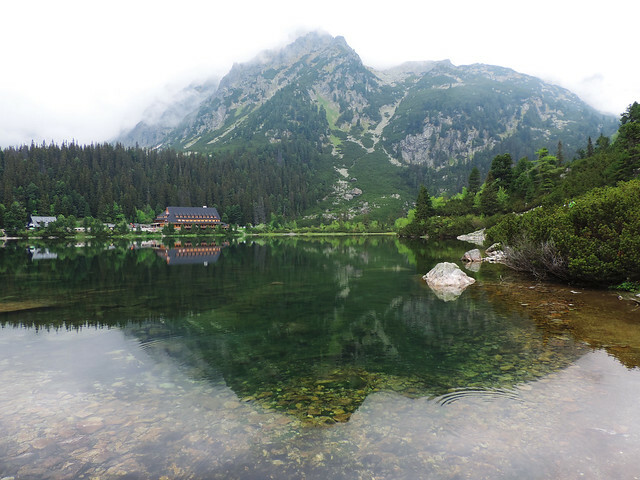 It’s the most accessible lake in the High Tatras as the parking lot is 5 minutes walk from the lake. There’s also restaurants and hotels around the lake and the loop trail around it is a popular walking and jogging route. If you are looking for a very short and easy hike then this loop trail around Štrbské pleso could be a perfect choice. It takes only about 40-50 minutes. Štrbské pleso is a nice place to hang out, but it’s quite busy, too. We found it the most beautiful on early mornings and late afternoons when the weather is calm and it reflects all the surrounding peaks like a huge mirror. It’s also an important location for hikers as several trails start from the lake. Like the red route towards Popradské pleso. 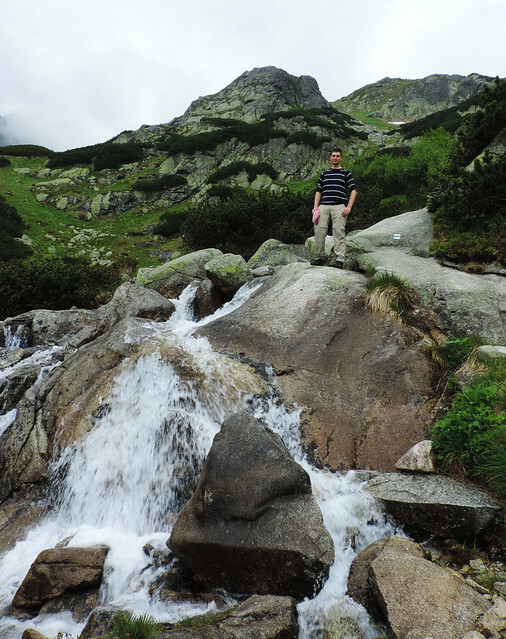 The hike to Popradské pleso takes about 1-1.5 hour and it’s still quite easy. (Of course, it depends on who says it, but the elevation change is only about 150-200 metres.) It started in the forest but we got our first peak views very soon and we had them for the rest of the hike. With that said, Popradské pleso is also easily accessible. That means it’s not yet feels like you are out in the wild. There’s a restaurant and a hotel by the lake so you can even have a warm lunch if you want. There’s an easy loop trail around Popradské pleso. So if you don’t want to continue on more strenuous trails you can just walk around the lake and then go back to Strbské pleso. But you have several choices to continue further as well. One option is to take the blue route to Veľké Hincovo pleso. The blue route runs through a charming valley (Mengusovská Valley or Mengusovská dolina in Slovak) surrounded by wild peaks which looked quite mysterious in the fog. The meadows are full of wildflowers from early summer and we crossed several crystal creek mountain creeks on the way. The route got steeper in the last section and we hiked in the snow at the end. 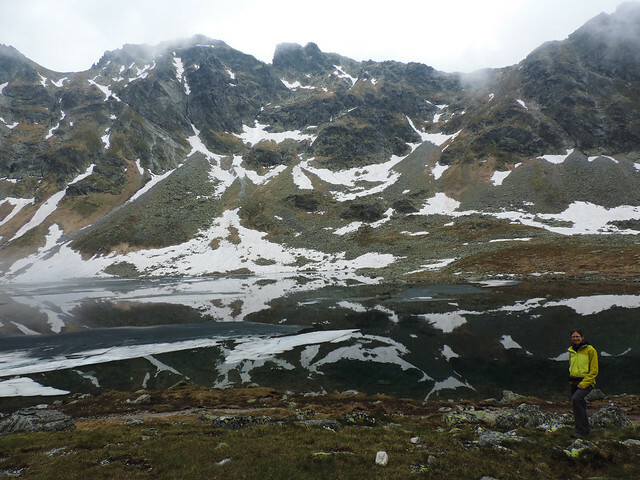 It was mid-June but the area around Veľké Hincovo pleso was still covered with snow and the surface of the lake was mostly frozen. All in all this landscape in the fog made us feel like we entered another world, a secret winterland. But some colorful flowers already popped up their heads from the blanket of snow. Veľké Hincovo pleso is a perfect day hike. You can find accommodation in the small town of Strbské Pleso (right by the lake), but Poprad is also not far (half an hour drive from Strbské pleso). Poprad is a bigger city so if there’s no available rooms in Strbské Pleso – which can easily happen in high season – you are still good to find something in Poprad. Finally, this is not the end of it. This post is just a first piece from our series featuring our favorite day hikes in the High Tatras. So stay tuned for more beautiful hikes – you can see them all here!